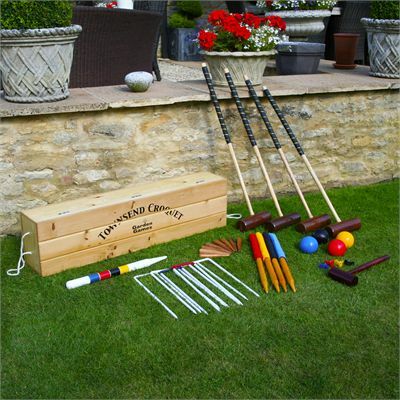 The Garden Games Townsend Croquet Set is a full-sized boxed croquet set which comes with a full set of accessories you need to enjoy the game. It includes solid octagonal Ash mallet shafts with leather bound handles to provide players with solid yet comfortable grip. This elegant set comes in a solid pine wood presentation box with metal clasps and nylon rope handles. It makes for a great gift idea and will bring hours of fun to families and friends. for submitting product information about Townsend Croquet Set We aim to answer all questions within 2-3 days. for submitting product information about Townsend Croquet Set. We aim to answer all questions within 2-3 days. If you provided your name and email address, we will email you as soon as the answer is published. 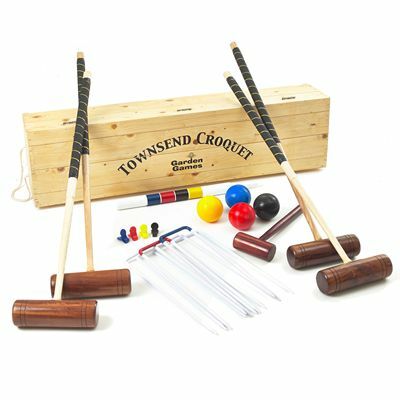 for submitting product review about Townsend Croquet Set.